There's a new kid in the town of wine importing. Blue Danube Wine imports some very interesting wines from countries along the Danube river including Austria, Croatia, Germany, Hungary, Montenegro, Serbia, and Slovenia. 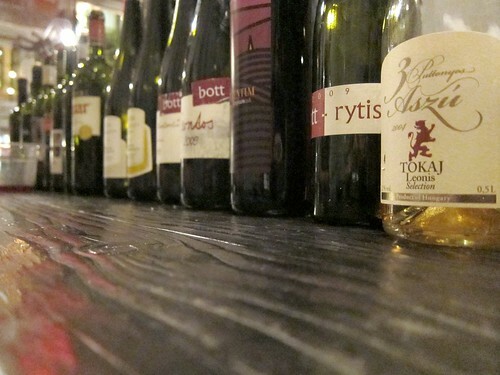 I've never encountered or even thought about the possibility of wines from these regions with only one exception (Tokaj from Hungary), but a blogger tasting (held at Mignon in downtown LA) guided by Stetson Robbins from Blue Danube Wine really opened up my palate. Forget the wines themselves, some of these grape varieties I hadn't even heard of. There was a 2009 Kekfrankos from Hungary's Pfneiszl winery, which is transitioning into an organic operation. 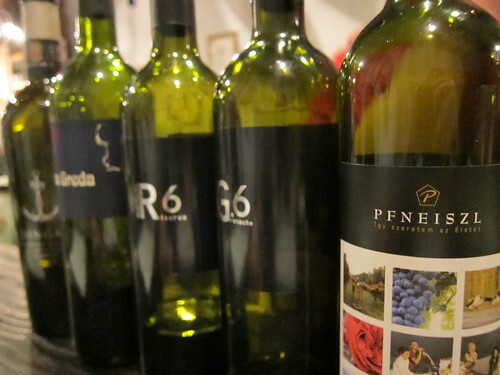 Bibich had a strong series of wine, including the G6 (made with grenache) and R6 (made with Babić, Lasin, Plavina). We tried a nice white wine from Bibich Winery, 2009 Debit, a grape variety indigenous to Croatia's Dalmatian Coast. We finished off with some dessert wine, including Tokaj of course. This wine amateur finally learned at this tasting what "puttonyo" refers to. Puttonyo is a 25 kg basket (~6-gallon container) and when used in reference to dessert wines means how many of these containers' worth of grapes were used to make that wine. Naturally, the more puttonyos are used, the sweeter and more expensive the wine is. We had a lot of great and very interesting wines at the tasting, and most of these wines are more reasonably priced than their counterparts (I have my eye on some of their inexpensive dessert wines!). Since the company is pretty new, the wines aren't available at retail shops yet. You can order them online through www.bluedanubewine.com though, and some restaurants in town are already carrying them (like Lazy Ox Canteen). Thanks for a great blog article. We are glad you enjoyed our wines. One small correction: many of these wines are already available in Los Angeles stores and restaurants. We are happy to assist you in finding them. Frank - Blue Danube Wine Co.